Reusable Nail Dual forms are very popular right now. You probably saw tons of videos where people were using dual forms with acrylics and with hard gels. Dual forms can make your work super easy and fast with minimum filling, but if you don’t use dual forms correctly, your nails won’t last a day. 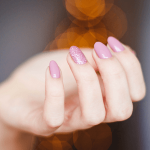 At first glance, Dual nail forms look like plastic nail tips, but unlike regular tips, they are reusable and filled with hard gels or acrylics and then applied to the nails, no tips, no glue and no paper forms needed. One of the best things about dual nail forms is once you apply the dual form to the nail (with gel or acrylic) you get a beautiful arch (the arch so many of us try to achieve). Unfortunately, if you will make the nail too thin, it will break before you know it. I saw so many people fail with their nail extensions, simply because they didn’t use them correctly. The reason why is simple, they didn’t add strength to their nail stress point. This step is significant to get a long-lasting manicure. 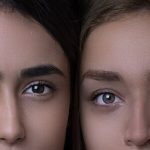 So, after so many people who did this wrong, I want to help you do this right. This is the full guide on how to use reusable dual nail forms / popits with gel and acrylic powder. How to Use Reusable Dual Nail Forms (Popits) with Hard Gel? Popits created to make your job a lot easier and faster. One of the main reasons why dual nail forms are so great is they save you a lot of filling time simply because there is not much filing needed. There are several issues you need to address before applying hard gel with popits. Hard gels tend to be super sticky, and they tend to run and slip from the sides and flood the cuticle area. Also, when applying popits on your natural nail, the under-nail area may need some filling work (with a nail drill). Having that said, after knowing were our problems could be, we can avoid them and get an amazing long-lasting nail extension with dual forms and hard gel. Hard gels are less durable than traditional acrylics. 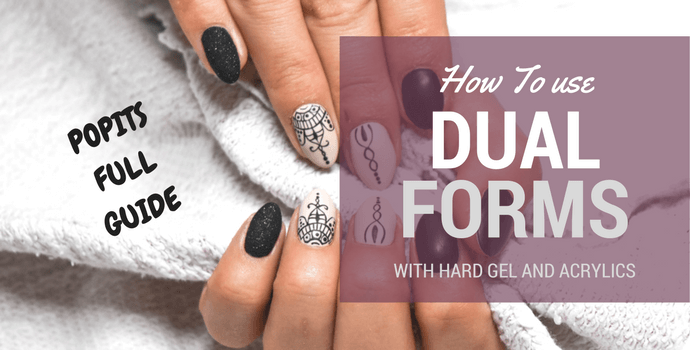 So, when I do my hard gel nail extensions with dual forms, I usually use the dual form and then add strength with an overlay of hard gel to secure the nail’s stress point. 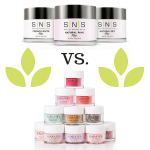 There are some great hard gel brands and products, such as young nails hard gel and Gelish Polygel (Read more: best hard gel full review and comparison). For dual forms, I prefer the Gelish Polygel just because he isn’t sticky as the other brands (also I feel it would be less messy for beginners). The Polygel is great because he “moves” like acrylics but doesn’t have the time limit like traditional acrylics. With a cuticle pusher or with an orange stick, gently push the cuticles back and efficiently remove any dead skin of the nail plate. Then, with a nail file, gently remove shine from the surface of the natural nail. After removing the shine from the natural nail use, a cotton ball dipped in alcohol and swipe the nails clean from any dust. After doing that apply a nail dehydrator and primer before applying the hard gel. Important: Some hard gel brands don’t use dehydrator and primer and use other products instead. Read the hard gel manufacturer’s instructions for use before gel application. Third step: How to pick the right size of your Dual forms? The trick with fitting dual forms is that you need to rise the dual form up a bit and then to make sure it fits from sidewall to sidewall. The reason you need to rise up the form slightly is you need to save some space for the product to lie in it. The way you need to hold it and rise the free end for about 10-degree Engle. Check all ten fingernails has a fitting dual form. Some hard gel brands require applying a base gel before the hard gel, so do that if you use hard gel such as “young nails”. Then, take a medium-sized bead with a gel brush and place it on the inner side of the dual form, move it gently and create the length of the nail. Fill sides and check there is no product missing (don’t make it too thin or too thick). After preparing the dual form gently apply the dual form to 2/3 of the nail – do not do all the way to the cuticle. Then cure in an LED/UV lamp for 60-120 sec (depends on the hard gel manufacturer’s instructions of use). You can gently use a pinching tool on the sides of the dual form, and it will pop off. After removing the dual form take a bead of hard gel and apply it to the nail and lightly pillow the bead as close to the cuticle area without actually touching it. Then, gently bring it down to the tip and cure the nails in LED/UV lamp again. After the gel is set, take a cotton ball dipped in alcohol and swipe the nails on the top and bottom. Shape and finish the nails. Remember to buff the surface if you want to use a gel top coat and cure. Finish with applying cuticle oil. How to Use Reusable Dual Nail Forms (Popits) with Acrylic Powder? I do acrylics with dual forms differently than with gel, and the reason is acrylics simply more durable then gels. So, with acrylics, I love to do a full nail dual form. The key to using acrylics with dual forms is to put enough product and build a good, beautiful and strong nail. Clean your nails with water and soap then use a cuticle pusher or an orange stick to push back your cuticles. Remove gently any dead skin from the nail plate. After doing that, gently remove shine from the nail plate with a gentle hand file. After removing the shine from the surface of the nail, clean the nails with alcohol (remove dust and derbies). Then, Apply a dehydrator and a primer on your natural nail. When using acrylic powder with dual forms, the fitting process is a bit different from fitting them with hard gels. After your nail is prepped and your cuticles are pushed back, use a dual form and put it on your nail. Lift, it up a little (10-degree angle) Check if it fits at the cuticle area and from sidewall to sidewall. The reason we lift the dual form a bit is to save room for the acrylic powder. Press gently and remove with an acrylic brush the excess of product that popped out from the sidewalls. After the acrylics get a bit warm, you can remove the dual form by gently pinching it with a pinching tool or with your hand. File and shape the nail. Usually, when using dual forms there is an excess product under the nail. 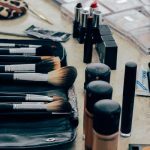 You can file and it with a UNC bit (nail drill) or if you want to avoid using a nail drill you can use nail tips on your natural nails and then use dual forms/ That way the area under the nail will stay perfect, and you avoid using a nail drill. Buff the surface of the nail to remove shine and use a top coat. Reusable dual nail forms can actually make your work on your nails much easier. It doesn’t matter if you’re using dual forms with acrylics or hard gels, Dual forms will shave off a lot of your manicure work time. Reusable nail forms are super easy to use, just pick the right size form and prep your nails correctly. If you liked our guide on How to use reusable dual nail forms / popits with gel and acrylics, please let us know. Fantastic thanks for sharing loved it now I’ll try and see how I go. Do you think you could fill all 10 of the dual forms at once then put them on all at cure.. this would save some time Because they won’t dry unless they are cured. Thoughts ? ?